Last summer I headed up to RHS Tatton Park Flower show for a designer day, mainly aimed at encouraging those of us who haven’t taken the plunge to in fact jump in with both feet and present a garden. I’ve heard mixed reviews about the benefits of doing a show garden, from the point of view of the designer that is. College tutors and other respected influences have said categorically it is a waste of money, time and every other resource. No clients will come of it, no uplift in business and likely a good deal of criticism. It’s expensive, estimate £500 pm2 of show garden and you’d be approaching the baseline of a realistic budget, it’s time consuming, frustrating, there is seemingly endless admin and paperwork to read and absorb and it is nerve wracking. All that’s before a spade has been put into the ground on site. Then there are those that swear by it as a way to get noticed, to add the cherished phase ‘RHS Medal winner’ to one’s byline, to get work and press about one’s business and to challenge oneself to present a concept, an idea of one’s own imagination with no real client. (at least for this garden I/we are the client). In all honesty I WANT this challenge, part of me is aware that it is a risk, what if it goes badly and so publicly? But then I do this for a living, albeit generally on longer timescales and without the eyes of the gardening world judging what I am doing. I’ve worked at RHS Chelsea in various guises and loved it, the interaction with gardening people is like nothing else. Completely intoxicating for me. SO in the end I had to ask myself ‘WHY NOT?’ rather than ‘WHY?’. I can do it once and then never again. Remember Charlotte Rowe’s reply to Monty when he asked ‘if they (RHS Chelsea) would see her back next year?’ a silent pause then a sincere ‘No’. After winning Gold for her first exceptional show garden there would be no return, at least not immediately. Unlike veteran Jo Thompson who shows up every year of late, presenting fabulous garden after fabulous garden. I may love it, I may not. After moving full steam ahead in August/September, finding a partial sponsor and a wonderful potter to make a bespoke water feature, a friend and colleague offered to share the project. Everything was falling into place. In November I attended the RHS roadshow event in Birmingham for all potential show gardenees where discussions were on plants quantities, logistics and the realities of building on a show site. I was even more determined to find the remaining funding on returning home. Then as life sometimes does, the following week a rather hefty curve ball hit. 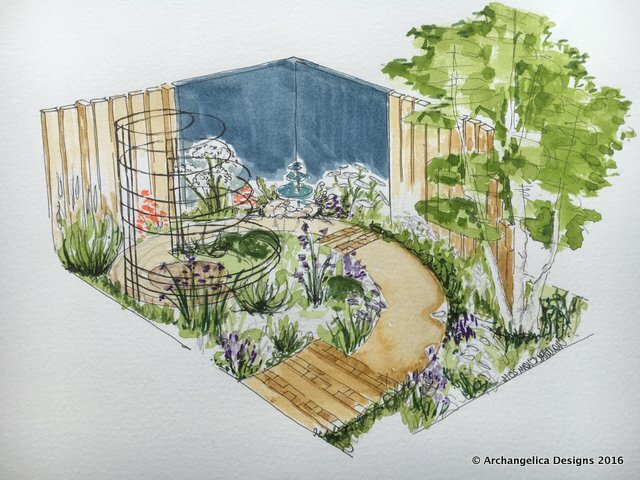 A close family member was struck down with a life threatening illness and all thoughts of presenting a garden at Tatton went onto the back burner. Thoughts turned to running two houses, running my business at a busy time and supporting the slow recovery of my beloved Sister while she endured a long hospital stay. By year end I was fairly certain Tatton would have to wait until 2017. January came and went, a call from my partner in crime to say we had two weeks to complete our submission if we were going to go for it, made me review the situation. My Sister was home and living independently, a small miracle in itself, and there seemed no reason not to. Two frantic weeks ensued. Designs, re-designed, and thought through again and again, worked up, reviewed and adjusted. 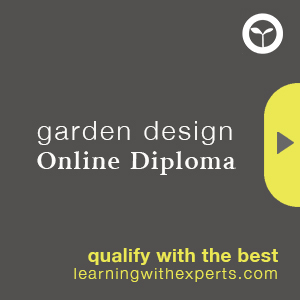 Planting schemes, poured over and considered, construction drawings worked through, out and over and finally, in a rush of excitement we completed all the online forms and hit the submit button. A tense few weeks followed, we had to provide some further information and adjust some drawings but finally at the start of March (8th to be precise!) we were in. Our garden at RHS Tatton was on the 2016 horizon. Next steps were fairly clear, to secure the funding and sponsorship for the project. We had estimated about 13.5k all told, (a requirement from the RHS is to work out a basic budget for each garden) including every possible thing we could think of, all the garden materials hard an soft, plants, landscaper, labour, machines, power, water, insurance, travel, accommodation and subsistence, then flyers, PR and 100 other small things we hadn’t really thought about. I suppose having done it once you have your lists and spreadsheets for every ‘next’ garden you do. I will admit I was fairly pessimistic at times that we would be able to secure sufficient funding. D-day was 31st May after which we would lose our £180 deposit for the garden plot if we pulled out. At that point we had just enough to finish the garden, by the skin of our teeth. It focuses the mind in new ways when you have a completely fixed budget with no leeway. But have a budget we did and on June 1st I felt a new surge of ‘go go go’ to our goal of a fabulous RHS Tatton Garden. We are presenting our garden Inner Sanctum under our collaborative name Archangelica Designs. follow us on Twitter and Facebook for daily updates..